OAS: Oceanic Art Society - great info from experts, collectors and friends of Oceanic art and artists - Join! Figure 1: New Guinea Highland warrior. Figure 2: Abelam ceremonial deoo with Papuan Hornbills. 3: Sepik River canoe prow. Artifacts used to illustrate the articles are not for sale. Please visit some of the dealers and art galleries for similar pieces. 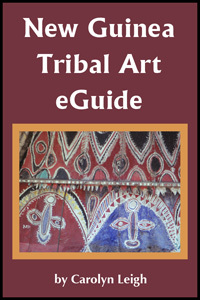 Join Ron in the jungles of New Guinea on his search for tribal art, 320 pages of adventure, over 450 early photographs, only $45 USDollars plus shipping. Order from us or from our dealers. 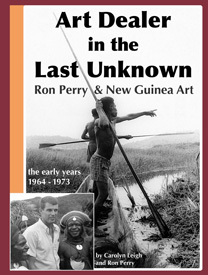 Who we are: Ron Perry, Carolyn Leigh & Doug Mehaffey - collecting New Guinea art in the field since 1964. Photographs, text and maps copyright © Carolyn Leigh, 1996-2018. All rights reserved. Art-Pacific has been on the WWW since 1996. We hope you enjoy our New Guinea tribal art and Indonesian folk art as much as we do.